Letter from LP to Mr. Charles C. Thomas RE: thanks him for sending a copy of Dr. Arthur Coca's new edition of Familial Nonreaginic Food-Allergy. [Letter from Mr. Thomas to LP included, not dated] [Filed under LP Correspondence: Box #410, Folder #18]. 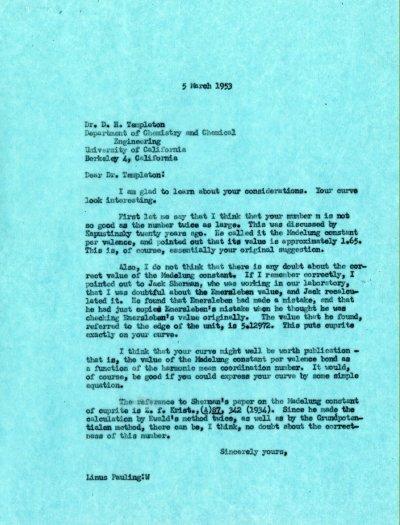 Letter from LP to Prof. I. M. Kolthoff RE: in response to Prof. Kolthoff's letter of enquiry, writes when he will be available for a meeting with Prof. Kolthoff. [Letter from Prof. Kolthoff to LP February 27, 1953, letter from Prof. Kolthoff to LP March 6, 1953] [Filed under LP Correspondence: Box #199, Folder #8].